Creators.com photo courtesy of Diane Kane Prevent household dangers for your pets as the family celebrates the holiday season. Now married with children, Whitney Cornish remembers one childhood Christmas when visions of sugarplums were fogged by the worry over the family pet, a Yorkshire terrier named Wheaties. When the diminutive pup became suddenly ill with severe gastrointestinal problems, a seasoned veterinarian came up with the diagnosis: Wheaties had been drinking water from the Christmas tree stand. Fortunately, both Wheaties and Maxi recovered and went on to enjoy many more holiday seasons. 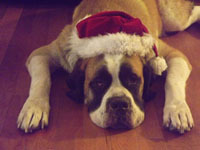 Poinsettias are toxic to most household pets if they are chewed or swallowed in large enough quantities. While holiday decorations can make a home feel more festive, they can be tantalizing traps for pets, says Pasternak. Pet owners should keep decorations and ornaments higher up on trees so they aren’t consumed by four-legged friends. Garland might look like a tasty treat to an animal, yet it can and will get stuck in your pet’s intestines, necessitating immediate surgical removal. Wrapping ribbon can be dangerous, too. If a cat should start gnawing on the ribbon, it will literally stitch the feline’s intestines together as it is being passed through the gut, says Pasternak. Also, pay close attention to what food your pet eats. While turkey and ham are included in almost every traditional holiday meal, the bones can become lodged in the intestines if swallowed. Don’t offer your pet table scraps, as it could become seriously ill or even choke to death. Poinsettias are toxic to most household pets if they are chewed or swallowed in large enough quantities. The level of toxicity is completely proportionate to the size and weight of the animal. However, instead of doing the math on that equation, it’s best to choose other types of floral arrangements that won’t be a danger to your pets. Remember that your canine friend doesn’t understand that the holiday season is all about peace and harmony. Some dogs do better with company than others, says certified professional dog trainer Madeline Gabriel. Be especially careful when children are around. “With lots of people around, it’s easy to assume that someone else is watching the dog and children,” she says. “Don’t assume. Assign a responsible adult to be the dog’s guardian, much like you’d do with assigning a guardian to watch over the pool. “Teach visiting children very clear rules about what they may and may not do around the dogs. Again, don’t assume that everyone has the same idea of what ‘be gentle’ or ‘leave the dogs alone’ means.